Discussion in 'General Discussion Forum' started by globaleagle, Mar 4, 2012. Why won't they let cows become pilots? Because the steaks would be too high! Hey it did say we can post jokes in here. Ok Ok, so why at school, when the bell rings to end lunch, the teachers want the kids to run as fast as hell back to the classroom, but when the bell rings for a fire, something that can kill, they want them all to walk out slowly and in an orderly fashion?? You have too much time on your hands Global. Too much time and not enough drinking was the problem, giddy from the manly win! My wife said to me the other day: "Let's go to Luxembourg!" I said "Nah, let's save up and go to DE-Luxembourg!!" So do you think that on the farm where Dolly the sheep was cloned that when the 2 dolly's came out the Rams went...woohoo! Twins! High five!! Is this the bad joke forum? The barman says "Why the long face?" This is an original jokes forum. They just also happen to be hilarious! Why did GE cross the road? Oh dear I won't be quitting my day job. Well the nucks are known as the 'goalie graveyard', so you're not too far off the mark!!! 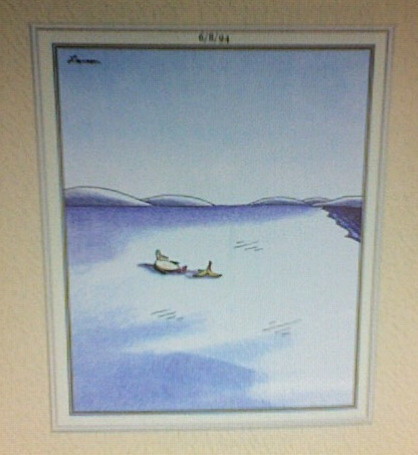 I thought of this 'far side' style of joke the other day. It's obv I'm no artist, but it's good enough. 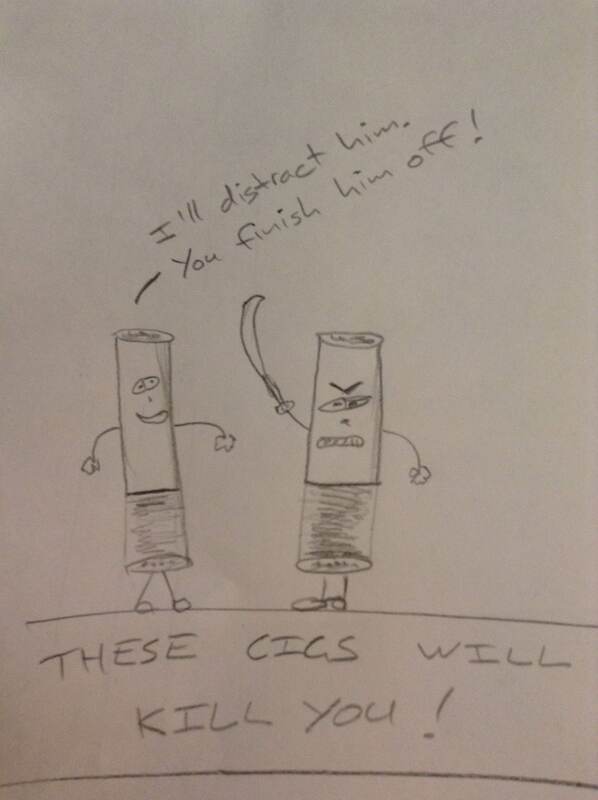 RE: These cigs will kill you!! 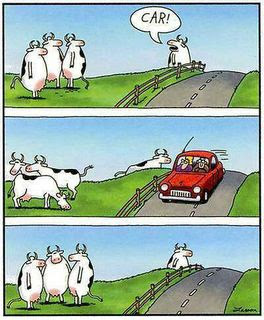 I'm like, it's a group of cows standing up talking to each other..how funnies that!.....nothing..zippo..!! Thanks Dan but I wouldn't go that far. You meant Larson didn't you. I used to tell people that sometimes the joke lies with what either happens just before or just after then panel itself! I remember a card once I bought for an ex girlfriend before she went overseas for a few weeks. It cracked me up, she opened it and didn't get it, I tried to explain it, and she found my explanation funny but still didnt get the card. I love it when people don't get it. I find it hilarious but that is my warped sense of humour. I showed it to leanne, she just looked at me as if I were a freak. I showed it to a mate rob. He also looked at me with the wrf look. I don't think it's entirely fair to be comparing my crappy pic with Mr GL's!!! * I love the penguin's face. Larson could bring out so much in such few pencil strokes! Do you really want to hear a stupid joke? I don't care your going to anyway. Why did the spider climb the wall?